“Almost all poskim are of the view, that if an ingredient which is not kosher is nullified in a final product manufactured by gentiles for gentiles, the final product is kosher. ( For those who are halachically minded some of the references are – Hagohos Shaarei Dura Shar 1, Shu”t Maharam Lublin 104; Chatam Sofer YD 62; Darkei Teshuva YD Siman 108 s”k 20 and more… see also Noda B’Yehuda Mahadura Tinyono Y”D 56 ). The two ingredients most likely to cause problems in soft drinks are either grape juice or cochineal (120). (The Manchester Beth Din does not consider grape derived anthocyanin as a problem but others do and as such we give the option of being mehader if 163 is contained in a product). If either of these ingredients were to be in a fruit juice or soft drink they would have to be mentioned in the ingredient listing and if they are the KA warns in the directory that they should not be used. “Any add-back ingredients not listed in the ingredients are precisely that – add back. That means that if it is an orange juice then orange juice derived ingredients may be added back. They invariably would pose no kashrus problem – but even if they did the amount would be so small as to pose no problem as above. “Therefore, it is the view of the Kashrut Authority that provided the guidelines are followed; any juice (and soft drink) is kosher and does not need to be further investigated. Any uncertainty as to the possibility of a non kosher ingredient or sub ingredient is covered by the above Halachic ruling of nullification. (It should be noted that the above ruling applies even if we know with certainty that a non kosher ingredient is nullified – the KA however only employs it in cases such as the above to obviate any residual doubt- see the introduction to our directory) .Products that have been verified to actually contain non kosher ingredients – even in nullifiable amounts – are generally not allowed by the KA. “The standard CIP used in cleaning pasteurisation and bottling equipment would certainly kasher from grape juice to regular fruit juice and this would be normal procedure. Similarly for those who do not keep Chalav Yisrael the normal CIP between milk products and juice would be sufficient for the juice to be considered Pareve. However for those who strictly keep Chalav Yisrael relying on a CIP is more problematic – even though there are strong reasons to argue that the since milk will cause a bad taste (be pogem) in the juice, CIP would be sufficient, never-the-less were it to be common practice to use the same dairy equipment there may be grounds to be stricter. However our experience with the major juice and (certainly soft drink companies) is that they generally do not use the same equipment for milk and juice. “Specialised UHT equipment poses even less of a problem as it is always sterilised at very high temperatures and under circumstances that are considered a full kashering. “I have written this at great length in order to explain all the issues clearly. Please feel free to contact me with any questions on the above. 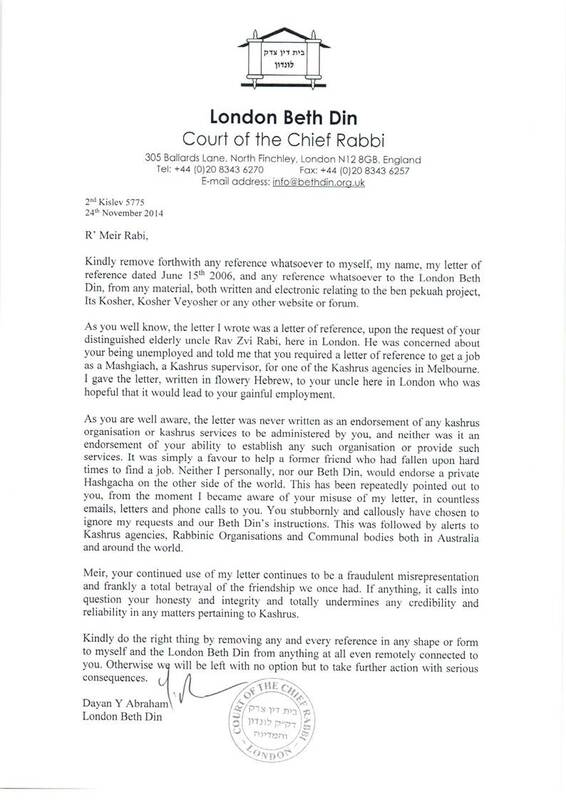 “The Kashrut Authority takes the view shared by Kashrut Agencies such as the London Beth Din and the Manchester Beth Din , that all soft drinks are kosher provided certain ingredients are not listed on the product label. Anything else that may be inadvertently in there would be nullified one in sixty. The same goes for slurpees. “This is a fully acceptable position with much halachic backing especially in countries where the kosher market is so small such as Australia and even the UK. You can see further elaboration of the principles involved in the halachic policy guidelines on our website. “Some kashrut organisations prefer not to rely on those principles – that is their perogative. We rely on the rulings of the Noda B’Yehuda and Tzemach Tzedek as well as others. “I want to add quite emphatically that while other organisations can take a different policy view , (if one follows the guidelines ) they can not say Slurpees are not kosher – that is simply not correct factually or halachically. All they can say is that in accordance with their policies they do not accept it. “It’s rather like what I wrote on another posting that our policy is not to accept 163. However other agencies do accept it. I can not – if I am intellectually honest – say a blanket “it’s not kosher” . “Note also that the kashrut of Slurpees , or soft drinks for that matter, does not change as you cross the border. If you follow our rulings you may consume them anywhere. If you follow the other view – they can’t be consumed anywhere. You should make a decision who you are going to follow and follow them. “One proviso – the Torah wants us to avoid machloket at all costs – so don’t slurp in the face of someone you know takes a different view unless you know they will understand. An example of a slurpee flavour that would not be acceptable under the NSW KA’s soft drink guidelines is the 7 Eleven Frozen Fanta Mango Passionfruit Light (Mango Zilched less than 1% sugar), as it contains glycerol as an ingredient. I personally do not hold by the NSW KA’s position on soft drinks and slurpees, but one cannot say, as Rabbi Gutnick has pointed out, that the latter are not kosher. I have difficulty with Rabbi Moshe Gutnick’s analysis. When YOU choose a flavour of slurpee with self serve, OR you ask the non-Jew to do so for you, then you ARE Mevatlim Issur Lechatchila. I’m not sure how to understand that in any other way, unless you know that the ingredients are kosher. Good news is around the corner though. I hear that Kosher Australia has managed to almost complete the most difficult job of finding the source of various syrups used in Australia (Coke products) and believe it or not some are from Zimbabwe. We will hear about this soon. In Melbourne, we have the rather strange situation of many people saying that “well, in Sydney it’s Kosher so it’s Kosher in Melbourne”. I don’t understand that attitude unless those people ask all their Melbourne Kashrus questions on products and the like from Rabbi Moshe Gutnick and his colleagues. The reality is they don’t. They simply assume, well, if HE says it’s okay, we can have it in Melbourne, even though Kosher Australia has grave problems with that (and Benedictine). You’d need to ask yourself why is Benedictine so elusive? Don’t the “monks” there respect that a Kashrus authority will not reveal ingredients. That’s a given. It’s time Benedictine was investigated properly from time to time, and the politics taken out of the issue. It’s not politics, it’s ingredients. So, check them. If they don’t let you check them, there is no chiyuv to be Meikel because A formula once used by the LR was deemed Kosher. There is nobody that I know who can attest that it’s the same formula as the 70’s. Companies change their approach. So, in the meanwhile, instead of assuming the Hungarian approach to Halacha that “nothing changes”, it behoves those with Yiras Shomayim to stop giving Benedictine a special status, and investigate it. If they refuse, then stop buying it. If Lubavitch stopped buying it, then their business would go down and they might change their view on allowing unfettered access to the factory(ies) that produce it. The LR took it off the table because it had a Tzelem. I’m not aware though that he knew the ingredients of every drink put before him. Surely, he’d say now, consistent with his approach, go ask a Beis Din/Rabonim to check is there is pikpuk. Where is the OK on this? What is R” Don Yoel Levy on this issue, and where is the apocryphal letter from R’ Lande which is applicable to 2014? 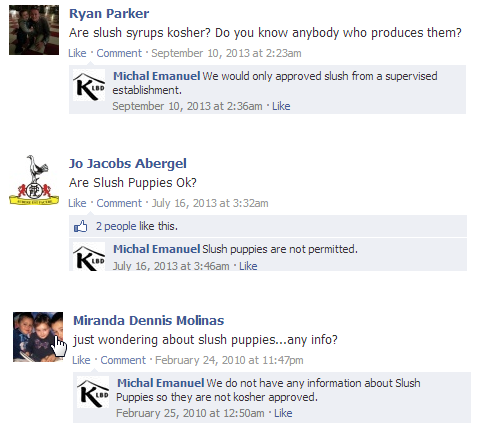 I don’t think R Moshe G’s policy on slurpees contradicts the LBD’s responses re slush puppies. With soft drinks, LBD says to check ingredient label for 120, grape juice etc. Whereas slushes do not come ingredient labelled, so one cannot see the ingredients. Hence the reluctance of LBD to approve. R Moshe G, on the other hand checks with the company on the ingredients. Unfortunately, the companies are not visible. They are all over the shop. As I pointed out to you recently, they found one supplier was Zimbabwe in Melbourne and luckily it had been checked by the South African Kashrus Authority. I concur with your reservations about slurpees. What is your source for the Rebbe taking it off the table because it had a Tzelem? The CRC one is old. I’m not sure how one can rely on any notion of Mirtas from the Monks. If anything, they are Chashud Lechatchilla as Mamash Ovdei Avoda Zoro! Isaac, I am surprised that you would adopt such a narrow (fringe charedi?) position by arguing that monks are lechatchila ovdei avoda zara! If indeed we are to regard Christians as ovdei avoda zara, then it would be far from certain that one could do business with them in the lead up to their holy days, lest their products purchased from Jews, or money obtained by doing business with a Jew, go towards their festivities. Another fascinating discussion of the subject is an audio lecture by Rabbi Berel Wein in which he contrasts the positions of the Rambam and Rashi/Tosfos towards Christianity – the latter did not at all regard Christians as ovdei avoda zara (http://www.rabbiwein.com/JewishChristian-Relations-br-Rashi-and-Rambam-Two-Worldviews-P382.html). with regards to the facebook capture you posted, in fairness, there seems to be a 3 year gap between the 2 slush puppy references. Slush puppies are, i believe, a brand name.